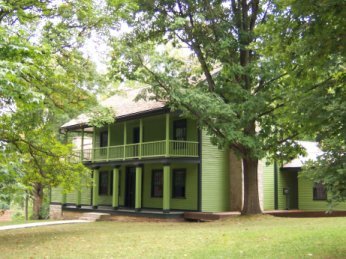 This historic site (a national park) contains one of President Ulysses S. Grant's homes on several wooded acres, as well as an interpretive center. The center has a refreshing cold water fountain and the cleanest restrooms on the trail. You may want to show your appreciation for these services by dropping some change into the collection jar. The driveway to the historic site crosses Grant's Trail 1/4 mile north of Gravios, and immediately south of the Grant's Farm parking lot. It's on the east side of the trail. From Hwy 270, take exit 3 (Gravois) and go east on Gravois 3.25 miles. Turn left at Grant Road, which is at the southeast corner of Grant's Farm. The site is about 1/4 mile ahead on the right - watch for the sign. Take the Elm Ave exit (exit 280). Go south on Elm just over a mile. Continue straight across Watson Road. Take the first right turn after Watson, which is Pardee Road. Continue on this road for about 1.5 miles: through two stop signs, by which time it has turned into Grand Rd. Be sure to go straight through both stop signs. The Clydesdale pastures will be on the left, followed by the Grant's Farm parking lot. The Grant Historic Site is on the left, just past the Grant's Farm parking lot.